Motor City Muckraker and Deadline Detroit collaborated on this series about Detroit’s declining police services. This is part 3. They dialed 911 and reported their emergencies: Two burglaries and three severe assaults in progress. A hit-and-run with injuries. It was shortly after 3 a.m. on Aug. 4, and Detroit’s neighborhoods had no available police. The average response time to the six urgent calls was three hours and three minutes. By contrast, at the very same time, police took just six minutes to respond to a suspicious person in Midtown. How fast do police come when you call? That depends on where you live. 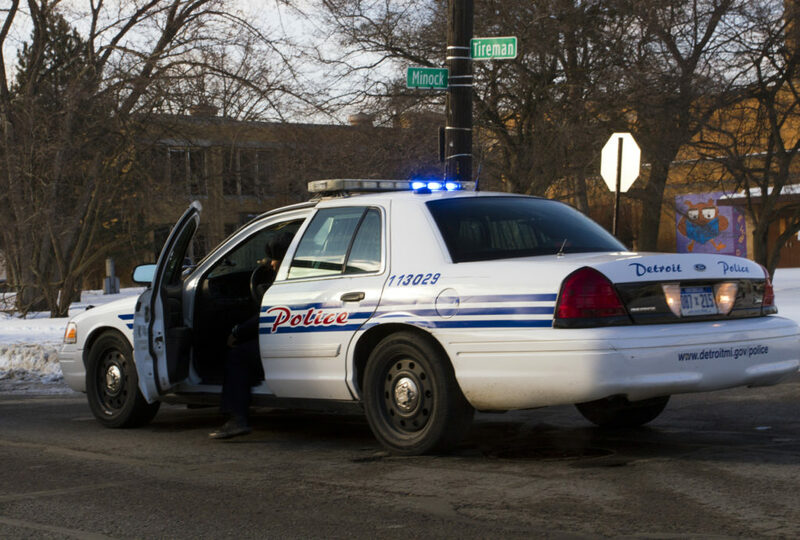 A joint investigation by Motor City Muckraker and Deadline Detroit found that police are much quicker to respond to urgent calls near downtown than in the neighborhoods. Citywide, police take about 40 minutes to respond to priority one and two calls, the most serious crimes, from burglaries and armed robberies to homicides and kidnappings, according to nearly 1 million police dispatch records obtained and analyzed by both news organizations. Our analysis found a stark contrast in response times between gentrifying downtown Detroit and the outer neighborhoods, where 911 calls are far more frequent. Consider this: The average response time to priority one and two calls is under 30 minutes in the Silk Stocking District, which includes downtown, Midtown and parts of Corktown. In the neighborhoods, however, the average response time is 44 minutes, about 50% higher. The analysis gives some credence to the narrative of two Detroits and the question of who gets what. The response times are the slowest in some of the city’s poorest, most crime-ridden neighborhoods, including Warrendale, Brightmoor, Jefferson-Chalmers, Chandler Park and Ravendale. Of the 26 zip codes with more than 2,000 calls to 911 in the past two years, six clocked in with response times over 45 minutes. Those zip codes – 48205 (east side) 48228 (west side), 48215 (east side), 48219 (west side), 48213 (east side) and 48223 (west side) – also are among the most impoverished, with an average per-capita income of $16,000, according to the U.S. census. By contrast, the six zip codes with the quickest response times – about 25 minutes – have an average per-capita income of $22,500. The average per-capita income in all of Detroit is $17,900, according to the U.S. Census. None of this surprises Robert Lewis, who lives in 48205, the zip code with the slowest average response time of 51 minutes. The area straddles Gratiot from Houston-Whittier to 8 Mile. When Lewis called 911 to report his son had just been robbed at gunpoint, he waited two hours and called back. The slow response times reinforce the risk of living in Detroit’s neighborhoods and erode the public’s confidence in police. Even more, longer response times translate to fewer arrests, according to a November 2018 Stanford University study. In 2018, Detroit police arrested 3,648 people for violent crimes, down from 4,622 in 2014, according to Michigan State Police. Tired of the relentless crime, Debbie Williams moved from her west-side neighborhood to the suburbs last year. Read the first part, second part, and third part of the series.